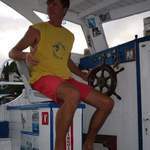 Petar is a very experienced local skipper who has been taking tourists on boat excursions in Montenegro for over 30 years. He has always had a love for the sea and boats. When he isn’t the skipper on his boat called “Orca” you will find him either fishing or diving. Petar is new to the SwimTrek team and will be skippering in Montenegro in 2016.